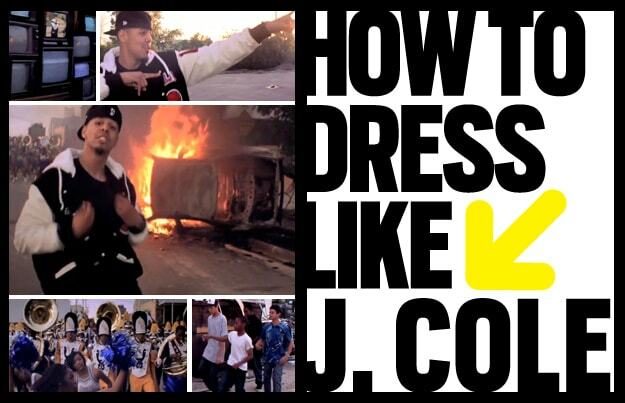 How To Dress Like J. Cole in "Who Dat"
If you caught Complex&apos;s June/July fashion piece featuring J. Cole, you are already familiar with the Roc Nation rapper&apos;s fresh style. With the video for his single premiering yesterday, the North Carolina native proves once again that he can hold his own when it comes to gear, and as a nod to that we&apos;re presenting How To Dress Like: J. Cole in "Who Dat". Although he&apos;s not dipped in premium sportswear like he was for our photo shoot, Cole&apos;s mostly black, street-ready outfit works wonders with the raw backdrop of the video and gives him that stylish-without-trying-too-hard look; a huge win as far as we&apos;re concerned.